Anton Stepanovich Arensky and Sergei Eduardovich Bortkiewicz are hardly household names. Arensky’s delicious Piano Trio in D minor continues to keep its place on the fringes of the chamber repertoire, and the Waltz movement from his Suite for two pianos receives an occasional outing; otherwise nothing. Who has even heard of Bortkiewicz other than aficionados of the piano’s dustier repertoire? Arensky was born in 1861 in Novgorod, a birthplace shared with Balakirev whose influence on the course of his country’s music during the second part of the nineteenth century was more profound than any other. Arensky, born a generation later and without the same musical genius and aggressive nationalism, fell under the spell of the post-Chopin/Liszt school (both composers revered by Balakirev and his nationalist ‘Free School’ of music). He was not going to extend the piano’s expressive potential as the mightier talents of Scriabin, Medtner and Rachmaninov were later to do. Arensky’s gifts were, nevertheless, precocious. By the age of nine he had already composed some songs and piano pieces. His father (a doctor and accomplished amateur cellist) and mother (her son’s first teacher and an excellent pianist herself) moved to St Petersburg and the boy entered the Conservatory there in 1879, graduating in 1882, a year after writing the present Piano Concerto. Arensky’s Opus 2 is unmistakably indebted to Chopin and Tchaikovsky, with the melodic grace of Mendelssohn and some of the more virtuosic passages of Liszt thrown in for good measure. (The last movement threatens to break into the opening of Grieg’s Piano Concerto!) Indeed, after hearing the work for the very first time, the listener somehow feels that he knows it intimately, like an old friend … undemanding, and for whom one has to make no special effort. The Concerto captured the imagination of many pianists of the day—it was a favourite of the youthful Vladimir Horowitz—and it provided an effective and stylish vehicle for many a barn-stormer before its salon prettiness came to be seen as superficial and second-rate. Arensky dedicated the work to the great cellist ‘Herrn Professor Carl Davidoff’ [sic], head of the St Petersburg Conservatory during the time the composer studied there. It was a dedication repeated when he composed his celebrated Trio in Davidov’s memory. The Concerto was published in 1883 and was an immediate success in both St Petersburg and Moscow. The composer, having won the Gold Medal for composition with his Symphony No 1 in B minor, was appointed Professor of Harmony and Counterpoint at the Moscow Conservatory. A successful if not adventurous career would seem to have been presaged by these youthful triumphs. Not only this, but he was befriended and championed by Tchaikovsky. A product of the Nationalist school of St Petersburg and now a star on the staff of the more international Moscow establishment, Arensky continued to compose prolifically as well as teach (Rachmaninov, Scriabin and Gretchaninov were among his pupils) until 1894. He resigned his post on being offered the directorship of the Imperial Court Chapel in succession to Balakirev himself, no less, who recommended Arensky for the position. 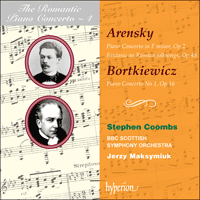 This involved a move back to St Petersburg and it is significant that the other composition of Arensky’s presented here dates from 1899 and is, again, a product of his life in the city headquarters of the Russian nationalist school: Russian themes in a cosmopolitan wrapping. The directorship of the Imperial Chapel provided not only a handsome salary but also a lifetime pension of 6,000 roubles a year for Arensky. Underneath this apparently ordinary story of modest acclaim and success, however, there ran a dark and troubled (though typically Russian) streak. Arensky, from very early in his career, was an alcoholic and an inveterate gambler. Moreover, his private life remains a mystery. He never married and elected to receive few visitors—an austere and unexpected contrast to the genial, expressive lyricism of his attractive music. He died of consumption in a sanatorium in Finland in February 1906. Later, from 1900 to 1902, he studied at the Leipzig Conservatory—piano with the former Liszt pupil Alfred Reisenauer (1863–1907), and composition with Salomon Jadassohn (1831–1902), another erstwhile Liszt student and among the most celebrated German pedagogues of the time, famously arch-conservative in his codified views on harmony and counterpoint. Unlike some of his Russian contemporaries (Rachmaninov, Medtner, Scriabin) Bortkiewicz was not a sufficiently gifted pianist to make a career as a soloist, though after his debut (Munich, 1902) he made several European tours. He made no records or piano rolls and while one critic felt he produced a ‘harsh, jarring sound’ others give the impression of him being only a capable player, at his best in his own works. His strengths, he eventually decided, were teaching and composition. He taught at the Klindworth-Scharwenka Conservatory in Berlin from 1904 until the outbreak of the First World War when he was forced to return to Russia. After the Revolution he left his native land, like so many never to return again, and after a peripatetic existence, including a two-year stay in (then) Constantinople, Bortkiewicz finally settled in Vienna in 1922, dying there in October 1952. ‘I am a Romantic and a melodist’, he wrote in an essay towards the end of his life, ‘and as such and in spite of my distaste for the so-called ‘modern’, atonal and cacophonic music, I do hope that I composed some noteworthy works without getting the reputation of being an epigone or imitator of composers who lived before me.’ Bortkiewicz’s compositions are dominated by those for his instrument and many are well worth investigating (Lamentations and Consolations, Op 17, for example, and some of the Preludes from Opp 13, 15, 33 and 40, Lyrica Nova Op 59 from 1940, and the 1907 Piano Sonata No 1 in B major, Op 9). Perhaps, like the present Concerto (he wrote two others), they lack profundity and originality in the widest sense. But does the only music we appreciate have to be by the great composers who overturned systems, struck out for the unknown, and challenged their muse? One hopes not. There must always be a place for those like Arensky and Bortkiewicz who reflect so elegantly and expertly on what has gone before, rather than shake us by the ears and grab us (sometimes screaming) into the future. On ne peut pas dire que les noms d’Anton Stépanovitch Arenski et de Serge Eduardovitch Bortkievitch soient très connus. Le ravissant Trio pour piano en ré mineur d’Arenski figure toujours tout juste au répertoire de musique de chambre, et on joue de temps en temps le mouvement de Valse de sa Suite pour deux pianos; à part cela, rien. Qui a entendu parler de Bortkievitch en dehors des amateurs du répertoire de piano le plus aride? Arenski naquit en 1861 à Novgorod, où était né également Balakirev, qui eut sur le cours de la musique de son pays pendant la deuxième moitié du dix-neuvième siècle une influence plus profonde que tout autre. Arenski, né une génération plus tard et sans le même génie musical ni le même nationalisme agressif, subit l’ascendant de l’école post-Chopin/Liszt (ces deux compositeurs étaient révérés par Balakirev et son Ecole Libre Nationaliste). Il n’allait pas élargir le potentiel expressif du piano comme allaient le faire plus tard les musiciens de plus grand talent Scriabine, Medtner et Rachmaninov. Arenski manifesta néanmoins des dons précoces. À l’âge de neuf ans il avait déjà composé plusieurs mélodies et pièces pour piano. Son père (docteur et violoniste amateur accompli) et sa mère (le premier professeur de son fils, et elle-même excellente pianiste) s’installèrent à Saint-Pétersbourg, et le jeune garçon entra en 1879 au Conservatoire dont il sortit en 1882, un an après avoir écrit ce Concerto pour piano. L’Opus 2 d’Arenski doit indubitablement beaucoup à Chopin et Tchaikovski, et l’on y trouve aussi pour bonne mesure la grâce mélodique de Mendelssohn et les traits les plus brillants de Liszt. (Le dernier mouvement menace d’entonner le début du Concerto pour piano de Grieg!) On a d’ailleurs l’impression, après avoir entendu l’œuvre pour la première fois, de la connaître intimement, comme une vieille amie … peu exigeante, et pour laquelle on n’a pas à faire d’effort spécial. De nombreux pianistes de l’époque s’enthousiasmèrent pour ce Concerto—ce fut une des œuvres favorites du jeune Vladimir Horowitz—que plus d’un cabotin utilisa pour l’effet avant que sa préciosité ne soit jugée superficielle et médiocre. Arenski dédia l’œuvre au grand violoncelliste «Herrn Professer Carl Davidoff» [sic], directeur du Conservatoire de Saint-Pétersbourg à l’époque où le compositeur y faisait ses études. Il dédia également plus tard son célèbre Trio à la mémoire de Davidov. Le Concerto, publié en 1883, eut un succès immédiat tant à Saint-Pétersbourg qu’à Moscou. Le compositeur remporta la médaille d’or de composition avec sa Symphonie no1 en si mineur et fut nommé professeur d’harmonie et de contrepoint au Conservatoire de Moscou. Ces triomphes de jeunesse semblaient présager une carrière brillante si ce n’est aventureuse. De plus, Tchaikovski l’avait pris sous son aile et s’était fait son champion. Produit de l’école nationaliste de Saint-Pétersbourg, puis vedette du personnel enseignant de l’établissement plus international de Moscou, Arenski continua à composer abondamment et à enseigner (Rachmaninov, Scriabine et Gretchaninov furent tous de ses élèves) jusqu’en 1894. Il démissionna pour prendre la direction de la Chapelle impériale, où il succédait au grand Balakirev qui l’avait recommandé pour le poste. Il retourna ainsi à Saint-Pétersbourg, et il est significatif que l’autre composition d’Arenski présentée ici, datée de 1899, est de nouveau le produit de sa vie au siège de l’école nationaliste russe: des thèmes russes dans un emballage cosmopolite. Le poste de directeur de la Chapelle impériale s’accompagnait pour Arenski d’une part d’un généreux salaire et d’autre part d’une pension à vie de six mille roubles par an. Mais cette histoire apparemment ordinaire de modeste succès dissimulait une nature sombre et tourmentée (bien que typiquement russe). Arenski était depuis les tous débuts de sa carrière un alcoolique et un joueur invétéré. Sa vie privée demeure en outre un mystère. Il ne se maria jamais, et recevait très peu de visiteurs—un contraste austère et inattendu avec le lyrisme jovial et expressif de son agréable musique. Il mourut de la tuberculose dans un sanatorium finlandais en février 1906. Plus tard, de 1900 à 1902, il étudia au Conservatoire de Leipzig—le piano avec l’ancien élève de Liszt, Alfred Reisenauer (1863–1907), et la composition avec Salomon Jadassohn (1831–1902), autre ancien élève de Liszt et l’un des plus célèbres pédagogues allemands de l’époque, ultra-conservateur dans ses idées codifiées sur l’harmonie et le contrepoint. Contrairement à certains de ses contemporains russes (Rachmaninov, Medtner, Scriabine) Bortkievitch n’était pas un pianiste suffisamment doué pour faire une carrière de soliste, bien qu’il ait fait plusieurs tournées en Europe après ses débuts à Munich en 1902. Il n’a laissé aucun enregistrement sur disque ou sur cylindre, mais si selon un critique il produisait un «son dur, discordant», pour d’autres il était seulement un musicien compétent, qui brillait surtout dans ses propres œuvres. Il finit par décider que l’enseignement et la composition étaient ses points forts. Il enseigna au Conservatoire Klindworth-Scharwenka de Berlin de 1904 au début de la première guerre mondiale, qui l’obligea à retourner en Russie. Après la révolution, Bortkievitch quitta son pays natal, où comme tant d’autres il n’allait jamais revenir, et après une existence itinérante, dont un séjour de deux ans à Constantinople, il finit par s’établir à Vienne en 1922, où il mourut en octobre 1952. «Je suis un romantique et un mélodiste», écrivit-il vers la fin de sa vie, «et en tant que tel, et malgré mon aversion pour la musique atonale et cacophonique, dite ‘moderne’, j’espère avoir composé plusieurs œuvres mémorables sans acquérir la réputation de n’être qu’un imitateur des compositeurs ayant vécu avant moi.» Les compositions de Bortkievitch sont dominées par celles pour son instrument, et beaucoup méritent d’être étudiées (Lamentations et Consolations, Opus 17, par exemple, et plusieurs Préludes des Opus 13, 15, 33 et 40, Lyrica Nova Op 59 de 1940, et la Sonate pour piano no1 en si majeur, Op 9, de 1907). Elles manquent peut-être, comme le Concerto enregistré ici (il en écrivit deux autres), de profondeur et d’originalité au sens le plus large. Mais faut-il n’apprécier que la seule musique des grands compositeurs qui ont renversé les systèmes, se sont lancés dans l’inconnu, et ont défié leur muse? Il faut espérer que non. Il doit toujours y avoir une place pour les compositeurs comme Arenski et Bortkievitch qui méditent si élégamment et si habilement sur ce qui les a précédé, plutôt que de nous tirer par les oreilles et nous entraîner (hurlant parfois) vers l’avenir. Anton Stepanowitsch Arenski und Sergei Eduardowitsch Bortkiewitz sind dem Namen nach kaum bekannt. Arenskis reizendes Klaviertrio in d-Moll hält seinen Platz am Rande des Kammermusikrepertoires, und manchmal wird der Walzer aus seiner Suite für zwei Klaviere aufgerührt; das ist schon alles. Und wer hat, von Kennern verstaubter Winkel des Klavierrepertoires einmal abgesehen, je von Bortkiewitz gehört? Arenski wurde 1861 in Nowgorod geboren, also am gleichen Ort wie Balakirew, der die Entwicklung der Musik seines Landes in der zweiten Hälfte des 19. Jahrhunderts tiefgreifender beeinflußte als jeder andere. Arenski, eine Generation später geboren und nicht mit soviel musikalischem Genie und aggressivem Nationalismus begabt, geriet in den Bannkreis jener Schule von Anhängern von Chopin und Liszt (beide Komponisten wurden von Balakirew und seiner nationalistischen „Musikalischen Freien Schule“ verehrt). Es war ihm nicht bestimmt, das ausdrucksmäßige Potential des Klaviers zu erhöhen, wie es später die größeren Talente von Skrjabin, Medtner und Rachmaninow tun sollten. Immerhin waren Arenskis Gaben früh entwickelt. Mit neun Jahren hatte er bereits einige Lieder und Klavierstücke komponiert. Sein Vater (Arzt und talentierter Amateurcellist) und seine Mutter (erste Lehrerin ihres Sohnes und selbst eine ausgezeichnete Pianistin) zogen nach St. Petersburg, und der Junge trat dort 1879 ins Konservatorium ein. Sein Studienabschluß erfolgte 1882, ein Jahr, nachdem er das vorliegende Klavierkonzert geschrieben hatte. Arenskis Opus 2 ist unverkennbar Chopin und Tschaikowski verpflichtet und weist obendrein etwas von der melodischen Anmut Mendelssohns und einige der virtuoseren Passagen auf, wie sie bei Liszt vorkommen. (Der letzte Satz droht in die Einleitung von Griegs Klavierkonzert umzuschlagen!) In der Tat hat der Hörer, nachdem er das Werk zum ersten Mal gehört hat, das Gefühl, es bereits eingehend zu kennen wie einen guten Freund … der keine Ansprüche stellt und mit dem man sich keine besondere Mühe geben muß. Das Konzert regte seinerzeit die Phantasie vieler Pianisten an—es war eines der Lieblingsstücke des jungen Wladimir Horowitz—und diente manch einem Musiker auf Tournee als wirkungs- und stilvoller Programmpunkt, ehe man seinen schmucken Salonmusikcharakter als oberflächlich und zweitklassig anzusehen begann. Arenski widmete seine Komposition „Herrn Professor Carl Davidoff“, einem bekannten Cellisten, der um die Zeit, als der Komponist dort studierte, dem Petersburger Konservatorium vorstand. Es war dies eine Zueignung, die sich wiederholte, als Arenski sein gefeiertes Trio zum Andenken an Dawidow komponierte. Das Konzert wurde 1883 veröffentlicht und war sowohl in St. Petersburg als auch in Moskau sofort ein großer Erfolg. Arenski, der mit seiner Sinfonie Nr. 1 in h-Moll die Goldmedaille für Komposition gewonnen hatte, wurde zum Professor für Harmonielehre und Kontrapunkt am Moskauer Konservatorium ernannt. Anhand dieser frühen Triumphe durfte man von ihm eine erfolgreiche, wenn schon nicht glanzvolle Karriere erwarten. Nicht nur das: Tschaikowski freundete sich mit ihm an und trat für ihn ein. Geprägt von der nationalistischen Schule von St. Petersburg und berühmtes Mitglied des Lehrkörpers am eher international ausgerichteten Moskauer Institut, komponierte Arenski bis 1894 eifrig weiter und unterrichtete (Rachmaninow, Skrjabin und Gretschaninow zählten zu seinen Schülern). Dann kündigte er seine Stellung, als ihm in der Nachfolge Balakirews, der Arenski persönlich dafür empfahl, die Leitung der kaiserlichen Hofsängerkapelle angeboten wurde. Damit verbunden war der Umzug zurück nach St Petersburg, und es ist wohl bedeutsam, daß die andere hier vorliegende Komposition Arenskis aus dem Jahr 1899 stammt und somit Produkt seines Lebens im städtischen Hauptquartier der russisch nationalen Schule ist: russische Thematik im kosmopolitischen Gewand. Die Leitung der Hofsängerkapelle trug Arenski nicht nur ein beachtliches Gehalt, sondern auch eine lebenslange Zuwendung von 6000 Rubel pro Jahr ein. Doch diese scheinbar gewöhnliche Geschichte von bescheidenem Ansehen und Erfolg hatte unterschwellig düstere, qualvolle (typisch russische) Züge. Arenski wurde schon zu Anfang seiner Karriere zum Alkoholiker und war dem Glücksspiel verfallen. Zudem ist sein Privatleben ein Rätsel. Er hat nie geheiratet und empfing aus freien Stücken kaum Besucher—ein nüchterner und unerwarteter Kontrast zum freundlichen, lyrisch expressiven Charakter seiner attraktiven Musik. Arenski starb im Februar 1906 in einem Sanatorium in Finnland an der Schwindsucht. Später, zwischen 1900 und 1902, studierte er am Leipziger Konservatorium Klavier bei dem ehemaligen Lisztschüler Alfred Reisenauer (1863–1907) und Kompositionslehre bei Salomon Jadassohn (1831–1902), einem weiteren einstigen Lisztschüler, der seinerzeit zu den gefeiertsten deutschen Pädagogen und in seinen festgefügten Ansichten über Harmonie und Kontrapunkt zu den Erzkonservativen zählte. Im Gegensatz zu einigen seiner russischen Zeitgenossen (Rachmaninow, Medtner, Skrjabin) war Bortkiewitz pianistisch nicht begabt genug, um als Solist Karriere zu machen, ging aber nach seinem Debüt (1902 in München) doch mehrmals auf Europatournee. Schallplatten oder Klavierwalzen hat er keine bespielt, und obwohl ein Kritiker meinte, daß er einen schrillen, unangenehmen Klang hervorbringe, lassen andere ihn als immerhin passablen Interpreten erscheinen, der seine Sache am besten machte, wenn er eigene Werke spielte. Seine Stärken waren, wie er schließlich selbst einsah, das Unterrichten und das Komponieren. Er lehrte ab 1904 bis zum Ausbruch des Ersten Weltkriegs am Klindworth-Scharwenka-Konservatorium in Berlin; dann kehrte er gezwungenermaßen nach Rußland zurück. Im Anschluß an die Revolution verließ er wie soviele endgültig sein Heimatland und ließ sich nach einer unsteten Phase, während derer er sich unter anderem zwei Jahre lang in Konstantinopel (wie es damals hieß) aufhielt, endlich 1922 in Wien nieder. Er starb dort im Oktober 1952. Gegen Ende seines Lebens schrieb er in einem Aufsatz, er sei Romantiker und Melodiker und hoffe, daß er als solcher und trotz seiner Abscheu vor der sogenannten „modernen“ atonalen und kakophonen Musik einige beachtenswerte Werke geschrieben habe, ohne in den Ruf zu geraten, ein Epigone oder Imitator vorangegangener Komponisten zu sein. Bortkiewitz’ Kompositionen sind mehrheitlich Klavierwerke, und viele sind durchaus der Erkundung wert (zum Beispiel Klagen und Tröstungen Op. 17, einige der Präludien aus Opp. 13, 15, 33 und 40, Lyrica Nova Op. 59 aus dem Jahr 1940 und die Klaviersonate Nr. 1 in H-Dur Op. 9 von 1907). Mag sein, daß es ihnen wie dem vorliegenden Konzert (er hat noch zwei andere verfaßt) an Tiefgang und Originalität im weitesten Sinne mangelt. Aber muß denn die Musik, die uns zusagt, unbedingt von jenen großen Komponisten stammen, die ganze Systeme umgeworfen, die Hand nach dem Unbekannten ausgestreckt und ihre Muse gefordert haben? Hoffentlich nicht. Es muß immer einen Platz geben für Leute wie Arenski und Bortkiewitz, die sich elegant und gekonnt zu dem äußern, was zuvor war, anstatt uns an den Ohren zu packen, gründlich durchzuschütteln und uns (manchmal unter Protest) in die Zukunft mitzuschleifen.